For those of you following Sally on Facebook you’ll know she’s down in Tasmania with the kids for the school holidays. Unfortunately for me (or maybe fortunately) I don’t get as much leave from work as Sal so I had to settle for just the weekend and have spent the last 3 days at home on my own. This little blog is my payment for a little surprise Sally gave me when I caught up with them last weekend. 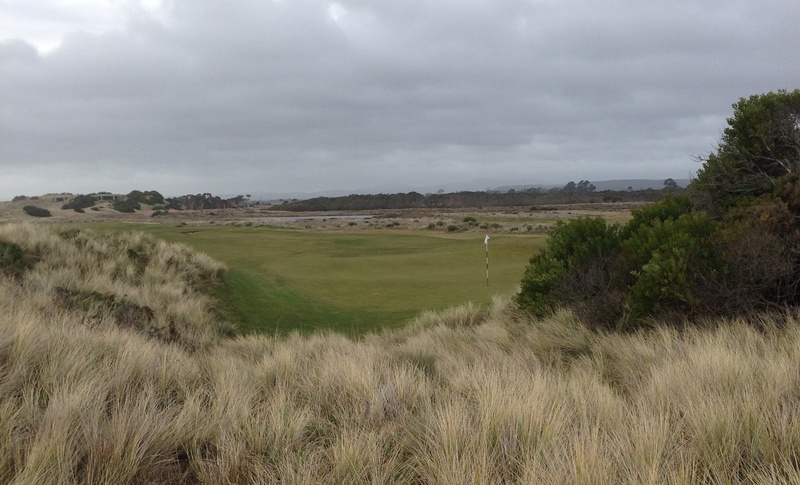 A round of golf at Barnbougle Dunes Golf Course! I flew down to Tassie straight after work last Friday to spend a couple of days with Sally and the kids, they had caught the ferry to Tasmania the night before. I was expecting a couple of full on days exploring Launceston and its surrounds as Sally doesn’t like to sit still for too long. When we arrived at the house, I had hardly put my bag down when Sal opened her suitcase pulled out my golf shoes and in an accusing tone said “what are these doing here”. I was taken aback and was thinking what’s going on I didn’t put them in there, is she accusing me of hinting that I want to play golf or something? 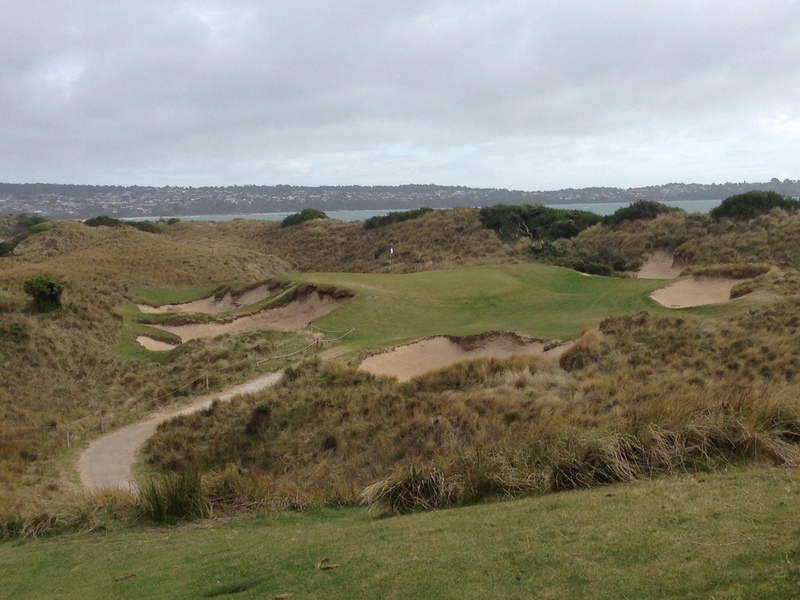 Turned out, she had booked me in to play a round of golf at Barnbougle Dunes the next day as a surprise and a nice surprise it was. 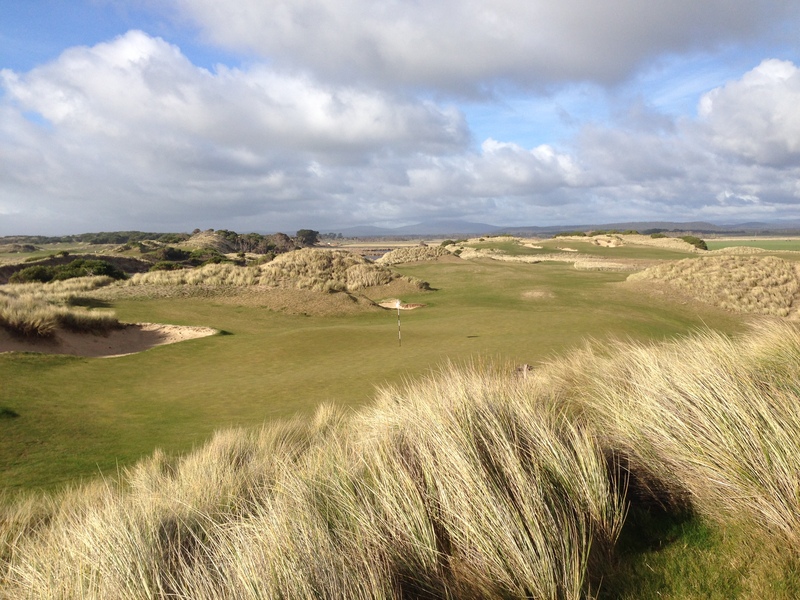 Barnbougle Dunes is rated number 11 in the world by Golf Digest magazine and truly is a spectacular place to play golf. 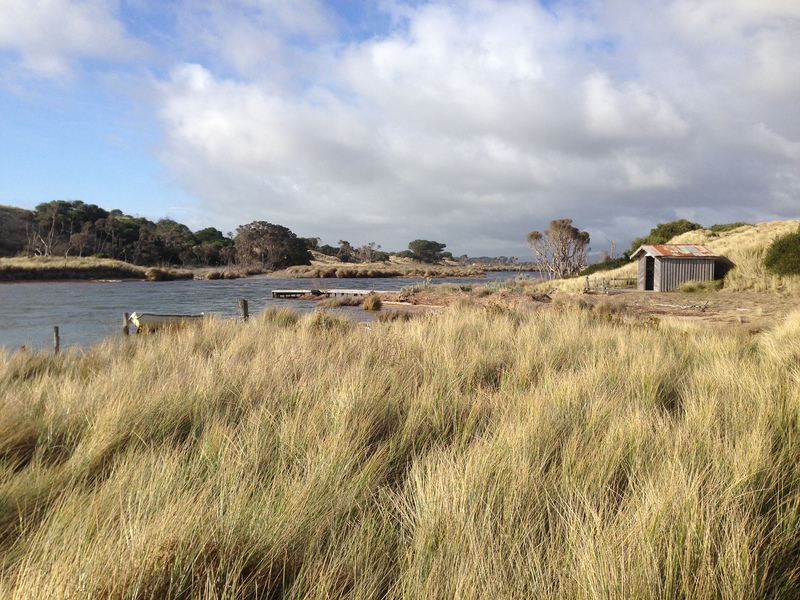 Situated just outside Bridport on the north coast of Tasmania, it took us about an hour to get there from Launceston. 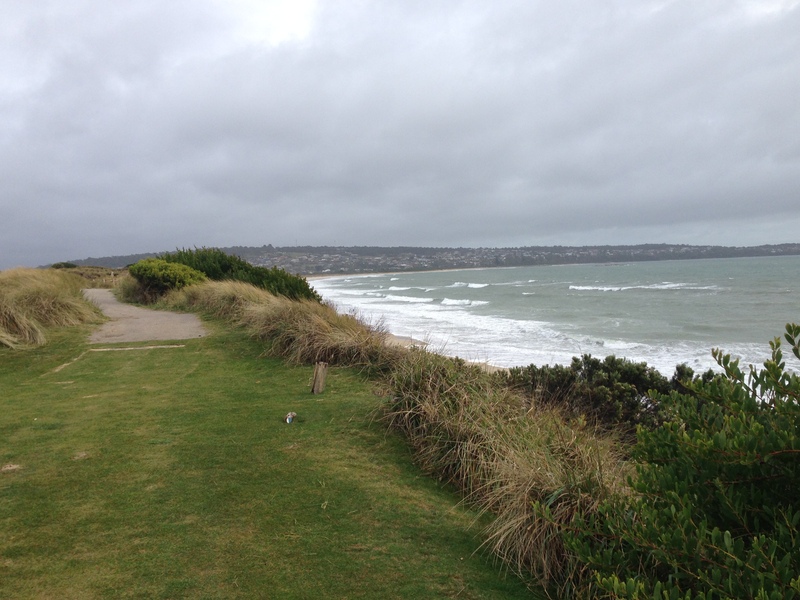 We pulled into the carpark and I jumped out of the car armed only with my smuggled golf shoes, my god it was cold (and grey and windy). I grabbed a set of clubs from the pro-shop and headed to the first with the kids in tow, they wanted to watch dad have a hit of the ball. It had been about 9 months since my last hit and not having my own clubs combined with staring directly into a howling gale I was worried. Here I was about to show the kids how ‘good’ I was at golf and I knew it could only go pear-shaped and pear-shaped it did! First shot, sliced into the rough, first ball gone. Second shot, sliced into exactly the same spot as the last one, ball 2 gone. A deep breath, a re-alignment and shot 3, sliced into the same spot as the first two. Well this was going to be interesting, I’d only bought 6 balls from the pro-shop. I shuffled the kids off back to Sal in the car and turned again to face the wind. I had a quick look for the balls without holding much hope but I did find someone else’s, only 2 down now. I would end up losing another 9 balls on my way around, I had to buy another 6 after 9 holes and found another 5 but it was worth it. It’s such a beautiful course and I think the grey and windy conditions really added to the atmosphere, you could almost imagine yourself somewhere on the coast in Scotland. There are two courses here, the other being the Lost Farm. The Dunes course heads west from the clubhouse for four holes and on this day directly into the wind before turning back along the coast. Heading back to the club was fantastic, I hadn’t hit a ball that far in years and after a couple of warm up holes into the wind I was starting to get my rhythm back. My luckiest shot of the day has to have been my tee shot on the par 3 7th. Hitting back into the wind I had to use an 8 iron to reach the green only 90 metres in front of me. The 98 metre par 3 seventh. 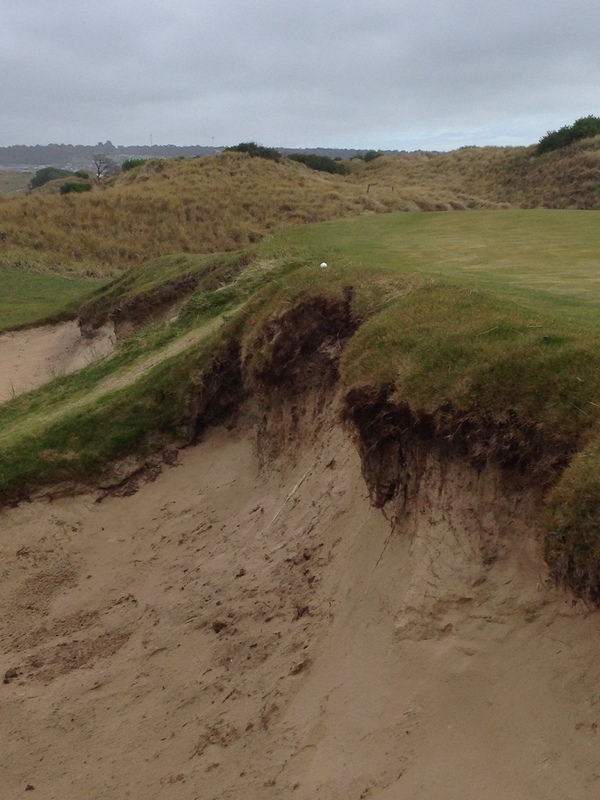 It was a great strike but it was drifting in the wind towards the left hand side bunkers. As it dropped I thought this was going to be my first bunker shot and by the looks of those bunkers it wasn’t going to be fun. It landed and plugged right on the edge of the front bunker, I stood and watched thinking surely it’s going to drop in but no there it stayed. Thank god for soft surrounds. I literally had to stand in front of the ball to chip it onto the green which meant there would be no birdie on this hole. I finished the front 9 in just under two hours with a very generous 50, that’s the great thing about playing by yourself, you can always hit another one. After a pit stop for a coffee and a muffin I called into the pro shop to buy some more balls and headed back out to the 10th. 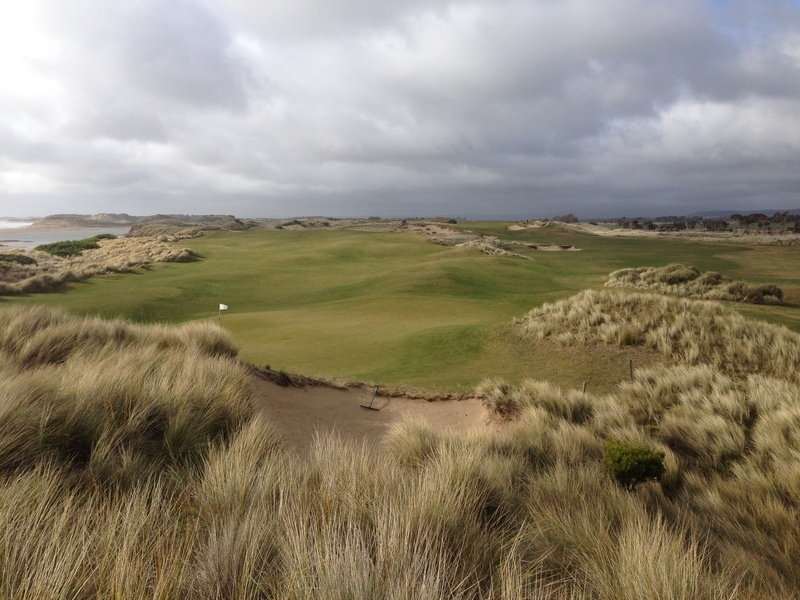 The back 9 is a lot more open and there are some great views of the Great Forester River that runs between the Dunes and the Lost Farm courses. It was also a bit more sheltered being down wind from the clubhouse. I was on the home stretch now and sent Sally a text to see how far away she was. They were already in the clubhouse having tea and babychinos. I told her I was heading for the 18th and to send the kids out as there is a small viewing area above and behind the green. I stepped up to the tee and could just make out the 3 of them waving at me and hit a nice drive up the fairway. Second shot into the green was my last chance to show off and I’d been hitting it pretty well. I was about 140 out but into the wind so I pulled out the 3 hybrid which I usually hit pretty well. Crack, slice to the right into the wasteland. Maybe they didn’t see it, ball two, crack slice right into the wasteland again. Are you kidding me, are these kids slice magnets? I bought plenty of balls might as well hit another, wasteland! 4th hit into the green, finally onto it straight this time but just short of the green. Chip up, two putts and in for a bogey ;-)!!! Back down the 18th from the viewing area. As I walked off the green the kids came running up wanting to know why I hit so many balls into the bushes! They had seen them all. All in all it was a great round of golf in a spectacular surrounding. I’d love to go back with a few mates and play both courses, maybe in warmer weather though. 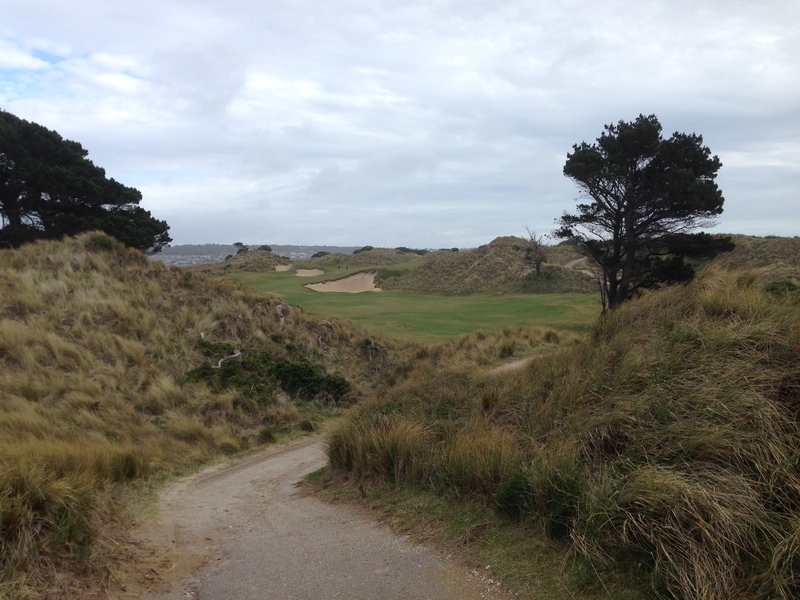 You can stay on course at both the Dunes and the Lost Farm and the Lost Farm has a restaurant, day spa and sports bar. I might try and organise it for our annual golf trip next year. So my payment is now complete, thanks for reading and I hope you enjoyed my little story. What did Sally get up to in Tasmania?? We visited Cradle Mountain, Bay of Fires, Mole Creek Caves and Seahorse World. We stayed at Swamp Cottage and Tamar Valley Resort while in Launceston.